A pioneering new drug study testing the safety of many common pharmaceutical drugs has revealed that almost half of all adverse drug reactions reported in Shanghai, from anaphylaxis to death, were caused by vaccines. This is a significant study for those who are anxious to dismiss vaccine dangers as just consumer confusion or merely anecdotal reports from those who are without real facts. Since many are wary to give weight to any reports that are not from a clinical setting, it is difficult to argue with this particular study’s findings. 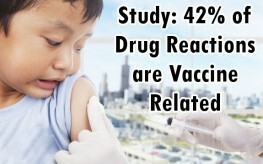 This is also one of the first-ever studies conducted on the topic of vaccines in China. The study quotes the World Health Organization (WHO) for its definition of an adverse drug reaction (ADRs) as ‘events related to a medication that are noxious, unintended and occur at normal doses used in humans for prophylaxis, diagnosis or therapy of disease, or for modification of physiological function.’ The WHO does not include deliberate or excessive consumption (overdose) in their definition of an ADR. The study found that ADRs are so globally problematic that they are in fact one of the leading causes of morbidity in many countries. A 1998 report published in JAMA found that 106,000 Americans die every year from correctly prescribed medications. These are not deaths from overdoses or misuse of drugs – another prevalent problem which is seldom discussed in the scientific community. Furthermore, the study finds that the younger an individual, the more at risk they become for harm due to vaccines and ADRs. Males Were More Prone than Females to ADR Dangers: A total of 1790 ADRs (40.41%) and 2640 ADRs (59.59%) were reported for female and male patients, respectively. Of note in the study – children under five are the most often vaccinated! Chinese vaccine schedules are similar to American schedules, often subjecting young children, prior to the full development of their immune systems, to a ‘polypharmacy’ approach, exposing their little bodies and minds to a cornucopia of combined toxins. The total affect of these toxins cannot be minimized. Their interactions are at least part of the reason for such high incidence of ADRs as well as death, not just their singular use. There is no way that small, developing bodies are ready for more than 12 different strains of vaccines before they even leave kindergarten. “With the seemingly constant flow of new therapeutic agents and new treatment indications for existing medications, polypharmacy is increasingly common. Drug-drug interactions (DDI) occur when two or more drugs are taken in combination and one drug influences the effects of another drug. This may subsequently cause a change in the pharmacodynamic or pharmacokinetic parameters which may lead to lack of efficacy, or to an increase in the number of reported adverse drug reactions. This study is monumental, in that it proves the onslaught of vaccines we give our children is not exactly a medical miracle as it has been touted. The autoimmunity generating properties of vaccines, and other chronic health issues associated with the presence of ‘hidden’ pathogenic viruses in the live and attenuated vaccines most commonly used in China and the underdeveloped or developing world, will become more curious to researchers with eyes to see how ‘preventative’ vaccines really are. We ALREADY know! You’ve posted this before so just remove this one.